Made it bend space and time. After breakfast with Linda Deneroff and Bruce Farr this morning, Lisa and I headed back to the convention center to see if there was anything we could do to help. The photo above was what the area near the Light Tower looked as we arrived. 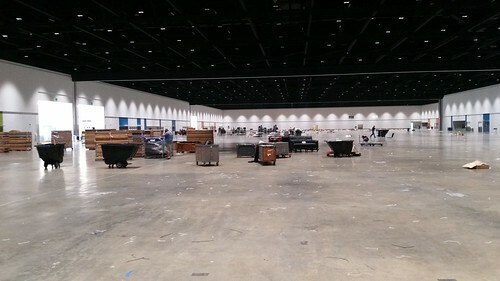 There were in fact jobs we could do, because the convention was rather short of bodies on site to move things. 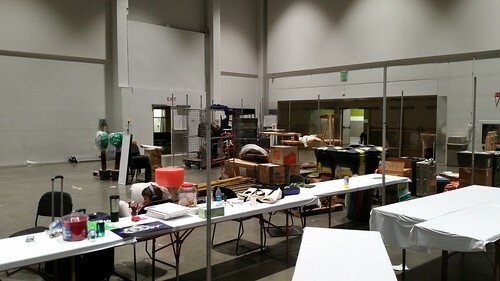 The photo above is the area behind the Art Show and small stage near the east end concessions in the exhibit hall known as the "Boneyard" -- effectively the Exhibits Division Office, where empty boxes, packaging, carts, and assorted stuff from Exhibits was stored during the convention. It was draped off and not signed, but those of us who needed to know where it was were there off and on throughout the convention. 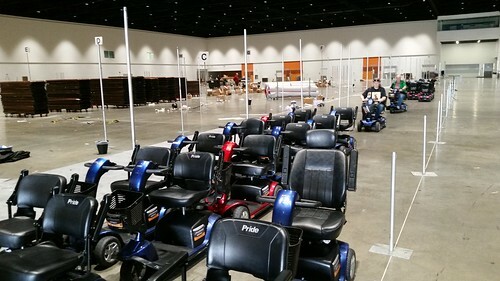 For example, Hugo Admin borrowed carts from them a couple of times to move award trophies from the Show Office (a small locked room near the Grand Ballroom) to the staging areas for the two Hugo Award ceremonies. Today the drapes were down and many, many things were moving out of the hall. 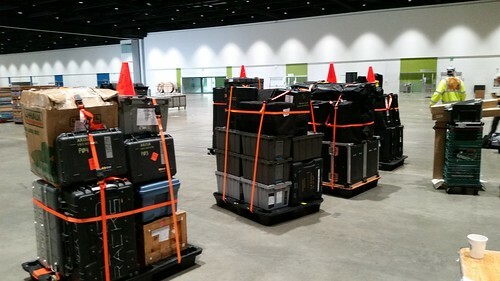 Some things were put on pallets to be taken down to the loading dock by the union forklift operators, where volunteers were to put them onto a truck to be taken to the convention's storage locker for later use. Lisa and I were volunteered for this, but it would be a while before we got to that, so we found other things to do. 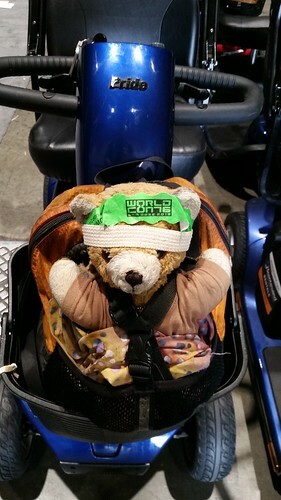 Kuma Bear, wearing a convention MIMO (Move In/Move Out) access band, sits in one of the mobility scooters saying, "Let's gets this roads on the shows!" Lisa, I, and others staged the many scooters rented by the convention to an area convenient to the loading dock waiting for a truck to arrive that would return them them to the agency from which we rented them. 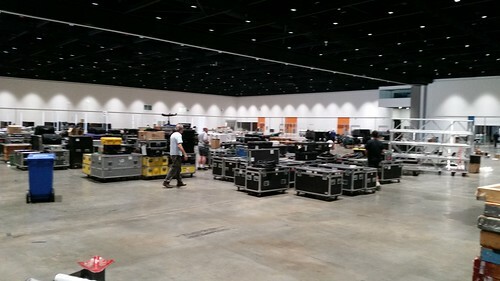 A mountain of rented equipment from the A/V contractor was staged on the floor as the contractor moved it out. This was not to be touched by the convention's people. Bruce Farr asked Lisa and me to help move some stuff to the small rental trailer and his car, which were parked near the loading dock. Among the things being packed was the red carpet we used as part of the Retrospective Hugo Awards event. Kuma Bear says, "Hey! Don'ts packs Bears in stuffys olds trailers!" When the mobie truck arrived, those of us who were handy drove the mobies down to the truck, where the contractor pushed them up into the truck and took them all away. I'm told that we never completely ran out of carts, which is good. Ideally, as Bruce Farr said, you want to rent all but one scooter; that way you know you've satisfied all demand. To my surprise, I had a WSFS job here on the day after the convention. Earlier, I got a call from Bruce telling me to come get the "Hugo Banner" from Program Ops. That turned out to be an 8' x 12' vinyl banner with the Hugo Award logo, used as a photographic backdrop. It's apparently rather too small for the intended purpose; however, rather than throw it away, we (thanks to Rick Kovalcik thinking of it) wanted to send it to Boston with the large amount of gear that they shipped to us. While it's not worth shipping that banner to Dublin or New Zealand, if the marginal cost is near zero as it is here, it's possibly worthwhile putting it into the Boston gear for (potential) taking to a (possible) 2021 Worldcon in Washington DC. The banner is sticking up in the middle of this pallet. After securing mobies, it was off to heft boxes of program guides and souvenir books. While some of them could be lifted on pallets directly into the rental truck, others were more effectively moved by a "bucket brigade." Scott Sanford had joined Lisa and I by then, and we and others out in the dock area formed a line and did our part to get the boxes onto the truck. I forgot to take a picture. 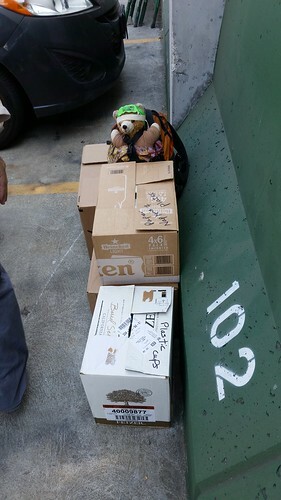 At a date yet to be determined, Worldcon 76 will get the publications out of the storage locker and package them for mailing to our supporting members and attending members who did not attend the convention. 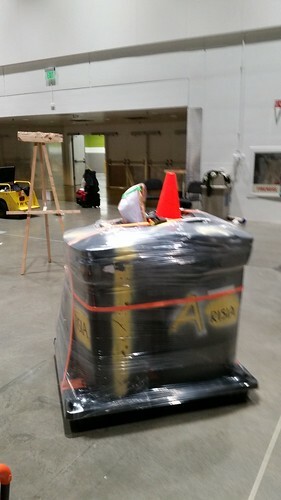 Also, there was convention gear (such as the San Jose Electric Light Tower) that had to move to storage now. 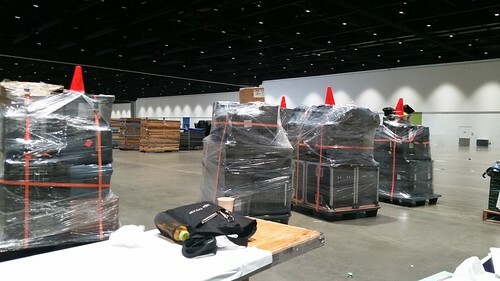 Here's a bunch of the Worldcon Tech Team pallets waiting to be wrapped up for shipment to Boston. And here they are after being shrink-wrapped for shipment. The cones are strapped to the tops of the pallets to indicate that these cannot be stacked and must be shipped only one pallet high. 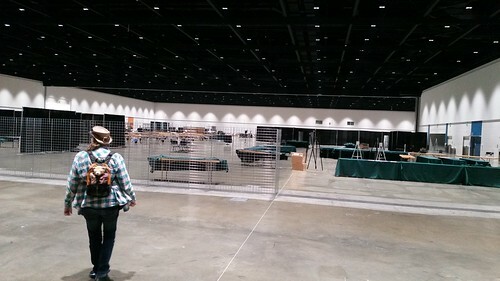 Lisa, Scott, and I hung around the Boneyard for a while, but eventually the convention decorator showed up to disassemble the tables, and it was time to leave. We salvaged what we could, including those things that seemed to be of value (we told the convention staff e-list about it so in case we've picked up something someone expected to reclaim is now with us) and put it into my minivan, and then we left the exhibit hall for the last time (see the second photo above). I was really hungry at that point, so the three of us went to Johnny Rocket's, where it was much quieter than it had been a few nights ago, where I think they could have made a good profit by staying open later than usual on the Friday-Saturday-Sunday of the convention. I destroyed a bowl of chili and a hamburger and felt much better. We wandered back to the Marriott via the Fairmont, where I was able to sneak into Club Regent in the Fairmont and show Scott the room where the 2011 Westercon had the giant Westercon Business Meeting when the 2013 Westercon site selection failed to produce a conclusive winner, and also where we hosted Match Game SF at that convention. At the Marriott I started to fall in chatting with some of the people there (like Sharon Sbarsky), but Lisa was clearly knackered. We said goodby to Scott and went back to the Hilton, and Lisa fell into bed. I wanted to let her sleep and I wasn't tired enough at 5 PM to go to bed yet, so I went wandering. That's when I shot the first photo above and thought up the song lyrics (to "Brother, Can You Spare a Dime," in case you hadn't figured it out) as I fought the melancholy that is always part of the "out day" of Worldcon. I love Worldcon and hate to leave it. I think one of the reasons why it's hard for me to not work on a Worldcon is that it's the only way to get over "Worldcon withdrawal." On the way back to the Hilton as darkness fell, I noticed that the electronic signs on the convention center still had us up there. I got a shot of the display. 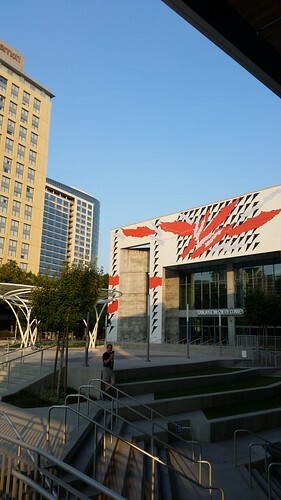 So, after years of bidding, two years of planning, and five days of frantic activity, that was Worldcon 76, the second Worldcon that SFSFC has held in this facility, and the third that we've hosted in the Bay Area. (1993 San Francisco, 2002 San Jose) I'm really happy with how this convention went. Yes, there were a lot of challenges, many of them quite public, and others that were "backstage" and resulted it much heartburn for people at all levels of the committee. But it appears to me from my discussions with as many people with whom I could talk (not all of whom I knew, or knew well) that nearly everyone here had a good time. I'm delighted with this. 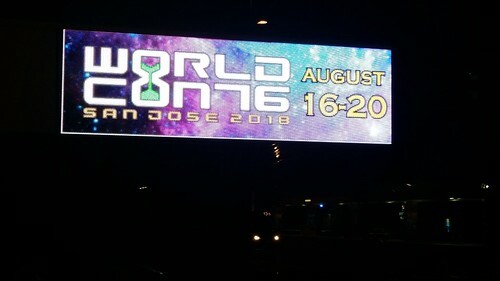 Worldcon is a party that our community holds for ourselves and our friends, including friends we haven't met yet. Those people of goodwill who want to join our community for our shared love of science fiction and fantasy are welcome, and I'm delighted that we were able to make so many people happy, and grateful to the hundreds of people (roughly one in ten members volunteered to work on the convention in some way) who helped make it happen. Tomorrow we have to pack out of the hotel room in the Hilton (fortunately, I was able to get a 1 PM check-out) and begin the process of heading home, which will take a couple of days for reasons that I'll explain later. But for now, I'm both sad and happy. Happy that Worldcon is successful; sad that our village of fandom is dissolved for another year, not to return until Dublin in 2019, with an intermediate stop in Layton, Utah at SpikeCon/NASFiC 2019/Westercon 72.